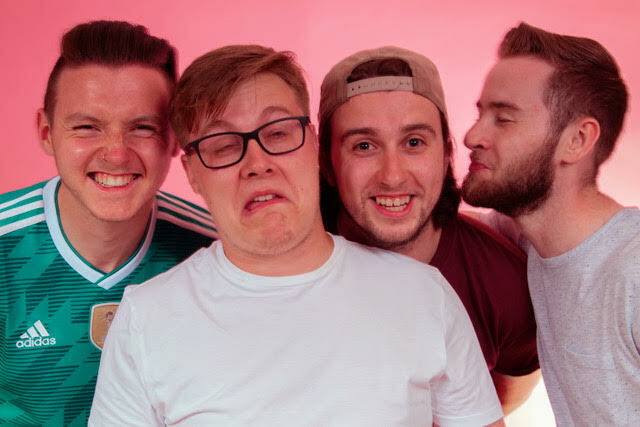 In this new occassion we have had the opportunity to interview the Pop Punk band WRTHLESS from UK. Check out the interview and this band on their FACEBOOK PAGE. We knew we wanted to hop on the whole, SWMRS, WSTR type vibes with the capital letters and missing vowels and such. One day we were sitting in the car, and ‘Worthless’ by Better Days came on. That’s pretty much it. Because it’s fun. We’re all aware it’s not the coolest or most relevant genre anymore. But we all love it. There’s something super infectious and pure about it. Jordan and me knew each other when they were wee guys and used to play football together. Then me and Jonny met through Jordan as they went to college together. Jamie and me were pals aswell, so it was pretty easy as we all kinda knew each other. Jonny’s is Blink 182. Jamie’s is Modern Baseball. Stuart’s is The Gaslight Anthem. Jordan’s is The Story So Far. General experiences in life. We’re not super into writing about particularly personal stuff, but we write a lot about what we observe in other people’s life’s. The last time we played was with three outstanding bands called Altered Sky, Take Today and Fear me December in Nice N Sleazys in Glasgow. It was a banger. (assuming this means play and not act) We really want to just get out and play in as many places as possible. Personally I want to head to London. Wouldn’t mind hitting up some of the more northern parts of Scotland. (Again we’re thinking this means like a song feature) Steve Aoki. Call us. Maybe a bit at the start. We’ve starting getting hyped up before we go on now which has helped massively. Apart from that just jump in at the deep and end try not to care about what other folk are thinking. A lot of bands we play with inspire us and help us a lot. Obviously we take musical inspiration from our favourite bands, but bands like Better Days have helped us a lot. Bands like The Decline and Carousel Kings just for their pure work ethnic. Being out and actually touring the world and doing it. Nothing to strange. We find it heavy weird when people just ask for photos and stuff in general. It’s difficult to comprehend because we’re just a bunch of wee guys from Scotland, so aye that’s quite weird for us.